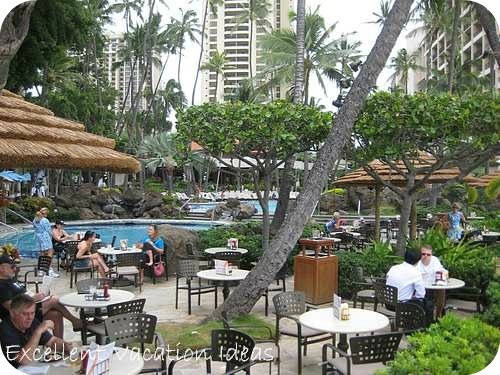 The Hilton Hawaiian Village, in Waikiki Honolulu on the island of Oahu in Hawaii is a great vacation idea if you are looking for a little bit of what you expect Hawaii to be - in the middle of Waikiki, Honolulu. In 2010, this resort was nominated as one of the "10 Best Beach Resorts for Families" in Parents Magazine. It has also made the "Top 25 Hawaii Hotels World's Best Award" in Travel + Leisure magazine a few times in the past 10 years and many other awards. 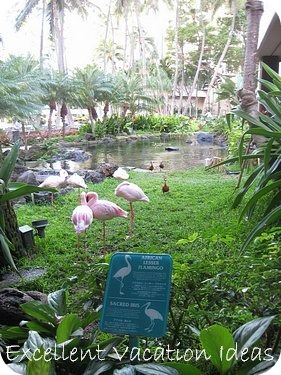 The Hilton Village is really the only true resort type hotel in Waikiki. It is a paradise in the middle of a metropolis. Honolulu is like any other big city in America. Many people - myself and our friends we travelled with included - get overwhelmed with Honolulu. It can be busy and crowded. The resort is right in the middle of Waikiki, and you can see the high rises all around you. The property has done a good job of making you feel like you are part of a resort however. We visited the Hilton Hawaiian Village to attend the wedding of our good friends, Andy and Michelle Walker (Check out our Entries in our Travel Journal). They decided to combine their vacation with their wedding and get married at the resort. So we booked a last minute flight and off we went on a great adventure! We had some great meals in the restaurants, played in the pools, the beach and the Lagoon, and stayed in the Rainbow Tower and the Grand Waikikian Tower. Have you visited the Hawaiian Village before? Share your experience here below in our FaceBook Comments. 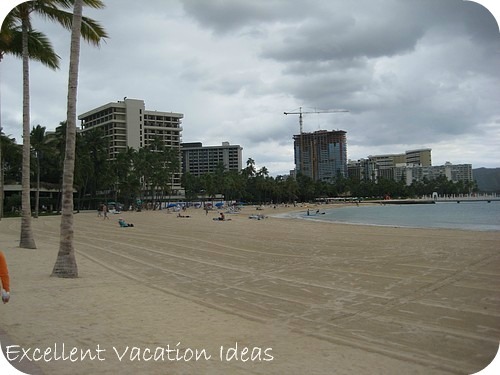 The Hilton Hawaiian Village Beach Resort and Spa is a large resort - 22 oceanfront acres - located on the west side and the widest stretch of Waikiki Beach. 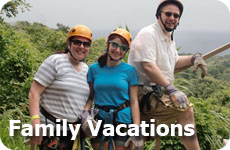 It caters to families, couples, weddings and conventions very well. Keeping that in mind it can be very busy. There are over 20 restaurants to choose from on property, endless activities, great shopping, the Duke Kahanamoku lagoon, the spa and 6 different towers and types of accommodations to choose from. The grounds are beautiful. You will find lush tropical gardens, waterfalls, Koi ponds, many different pools to enjoy, and a variety of animals - including the resident penguins and turtles. It is only 20 minutes from HNL - Honolulu International Airport - and about a 15 - 20 minute walk from great Waikiki shopping at the Ala Moana Center and from Kalakaua Ave. (where the restaurants and other hotels are). You can walk almost the whole length of Waikiki Beach starting from here to the foot of Diamond Head (I did it one morning - took about 1 1/2 hours there and back). They cater to weddings well (as we were there for one) and they offer all sorts of activities and entertainment - including a sunset luau Sundays to Thursdays and Hawaiian entertainment by the Super Pool on Friday nights. Each tower has it's own pool, and they recently completed their newest time share tower - the Grand Waikikian - we stayed here and it was fantastic. More about the Beaches and Resort.